The textured wave pattern worked in garter stitch and the cute tassels on this baby blanket (size approx. 48 x 68 cm/19"x27")) will motivate baby´s hands to explore. Four pretty colour block stripes will ensure that the knitting process won´t be boring. 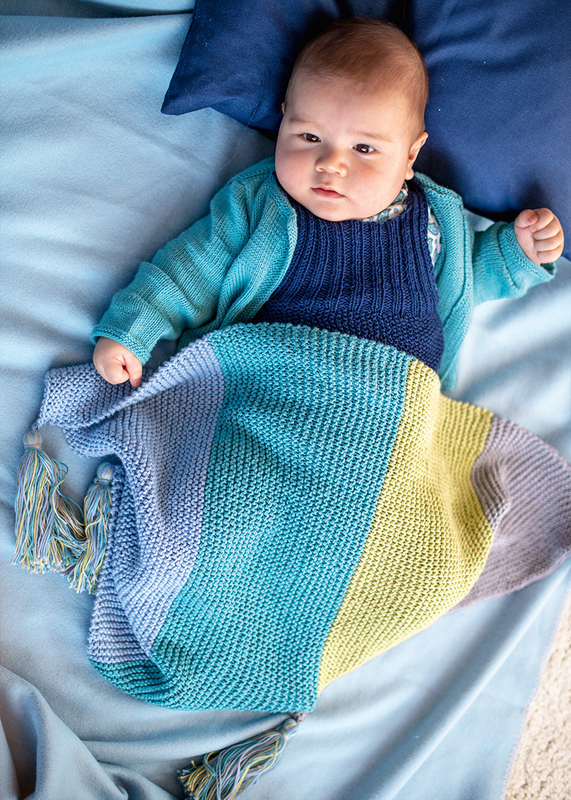 The blanket is worked with double strands and you can choose between the three yarns Baby Smiles Bravo Baby 185 (100% polyacrylic), Baby Smiles Cotton Bamboo (52% cotton, 48% rayon) and Baby Smiles Cotton (100% cotton). Since all yarns have the same gauge, they are interchangeable. A relaxing project that both beginners and advanced knitters will enjoy.